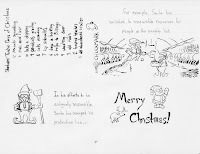 For quite some time now, I've wanted to design my own Christmas card. In the past, the closest I came to making my own Christmas card was a linoleum block print I attempted, and that failed miserably. I couldn't for the life of me get a good print. In 2009, I finally succeeded thanks to the assistance of my mother and my girlfriend. Both of them provided not just encouragement but also ideas for the card, and they both put up with my indecisiveness. Also, while they didn't see themselves this way, I felt they were both "clients" of mine, and I didn't want to disappoint them. My mother planned to use the card as her Christmas card, so she actually was a client. For experienced artists, I'm sure designing a card like this is no big deal. For me, my inexperience proved to be something of an obstacle and added to my insecurities and fed my procrastination. At any rate, my experience with the linoleum block print taught me not to waste my time this year with too much of a hands on effort. Maybe some other time I will attempt a more personal approach for the construction or printing of each card, but for this year I decided that if I wanted to get some cards made I should rely on professional printers. Early on I chose Overnight Prints to print my cards. I came across them via a tweet from a professional cartoonist who mentioned using them. Considering the time of year, I'm sure they were extra busy. The results were pretty good, and I had plenty of good cards I could send out. But the print quality was a bit uneven. So if I decide to print cards again this year, I will try to locate a printer local to me. I may not get better results, but at least I have the option of working more closely with them and not have my experience mediated through an opaque web site. Once I decided on a printer, all I needed was an idea. This proved to be the biggest obstacle in all this. I brainstormed with my mother one day while running errands in Billings, and we pretty much came up with the basic idea immediately. Great! Only problem was that it was scatological humor, and I was very reluctant to use that as a Christmas card. I wasted a lot of time trying to come up with other ideas and delayed working on the design. However, this may have been a good thing as we came up with three variations of the joke. The third one we came up with at the last minute, and I think it was the best. 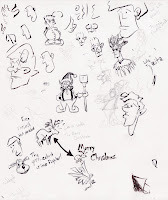 While brainstorming, I doodled and sketched on a couple of different pages. The page below was done at a coffee shop shortly after we came up with the first version of the scatological joke. I had already come up with the second version of the joke on the page. But it was harsher than the first joke, and I didn't really like it either. After delaying starting the card design, I finally gave in and decided to start working on the design based on the second joke. At this point, I was still doodling, but I was also trying to come up with final designs and working on the basic approach. I decided I was going to go for a cartoon look: black ink lines with flat colors. Here I have played with inking some ideas to see how they look. 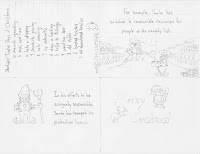 Here's a thumbnail of the interior of the card. I wasn't worried about details, just placement, proportions, and composition. I was worried that the interior scene was a bit crowded, but it seemed like it would work. Despite knowing the look I wanted, I still didn't know how I would render the design. Would I try to ink with an actual brush like I have with my other cards? Would I attempt to color with physical media? I wasn't sure, but I knew I would start with physical media as that is what I'm most comfortable with. So I started the tighter pencil drawing and scanned the card design at various stages of completion. That way I would have multiple versions, and should disaster strike, I would have options. It was somewhere in the process of rendering the tighter pencils (before lettering) that we came up with the third joke. My clients approved the new joke, and I kept working. This is a scan of tight pencils. You'll notice that I was able to fit the entire card design on one side of standard sized paper. This allowed me to work at the actual size of the final card. Initially I thought this was great as I would get to see the entire card all at once, but it may have been a poor choice as it forced me to work at the size of the card which was a bit small when it came to inking with a brush. I should have perhaps worked on the interior and exterior on separate pages at a larger size. I could've always reduced it in the computer. On the other hand, working at actual size did make sure I didn't put in details that wouldn't be seen when printed. It turns out my plan to scan my design multiple times was a very good idea. When I got done with the pencils, I decided to ink the page with a brush pen. I hadn't used this brush pen before, and the brush proved to be a bit too large for how small my original drawings were. When I got done, I was not happy with the results. So I gave up on those inks, and used ArtRage 2.5 as a virtual light table and ink pen. My scanned pencils were used as a tracing layer, and I worked on my "inks" directly in ArtRage. Oh, I also used a wacom tablet. This is an example of the "inks". Depending on your browser settings, the image may look a little funny because the background is transparent and only the ink lines are opaque. You'll notice I've also separated the interior of the card from the exterior as required by Overnight Prints' printing process. This is the interior inks. The transparency of the inked pages was important because it allowed me to easily approach the coloring stage. I probably could have done the whole card design in ArtRage, but ArtRage isn't about pixel perfect editing, and for the next stage, I wanted pixel perfect editing because I had to meet the very specific requirements of Overnight Prints. So I imported the inks into GIMP. There may be better tools for the job, but I found GIMP to be a great tool for the flat coloring I planned to use, and it allowed me to do pixel perfect editing. After importing the inks into GIMP, I arranged the inks on the page, and I proceeded to color under them using multiple layers: highlights, mid tones, and shadows. I also cleaned up various ink lines that I was dissatisfied with. This is the final exterior image that was used for printing. This is the final interior image that was used for printing. All in all, it took longer to make the card than I liked, but that was mostly due to my worried procrastination. I learned a lot in the process of making this card, and it has been received rather well. Most importantly, I actually enjoyed the process once I was able to put aside all my worrying about how it would turn out. I plan on making another one this year. There's only ten months before I have to send them out again! I better get started. Maybe something a little more tasteful this time? I loved your card! I still have it hanging up...lol. It's like art! So, become rich and famous..okay?